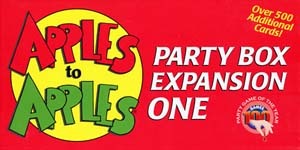 Apples to Apples - Party Box Expansion 1 contains an additional 576 cards to add to your Party Box edition! The laughter will continue late into the night as the Party Box Expansion 1 generates thousands of outrageous new combinations! Please note: This set contains every card from expansion set 3 and 4 from the original Apples to Apples core game. This set also contains the same cards as the Party Crate Expansion 1.